Paul Farnsworth, manager of the new dining Commons and Alumni Walk projects, reported that 140,000 flower bulbs were shipped our way from California on Sept. 11. The bulbs are scillas, which bloom around the same time as crocuses. So, early next spring, look for dense and lovely carpets of medium-blue blossoms around the birches and between the pathways throughout Alumni Walk. If you’re curious about the specific locations, look for the patches that the landscapers left bare as they laid sod this week. The intention, Farnsworth added, is to pretty much finish landscaping Alumni Walk and the area around the new Commons this fall. Paving crews are hard at work with the goal of extending the accessible area of the cross-campus connector east of Pettengill Hall by the week of Sept. 17. 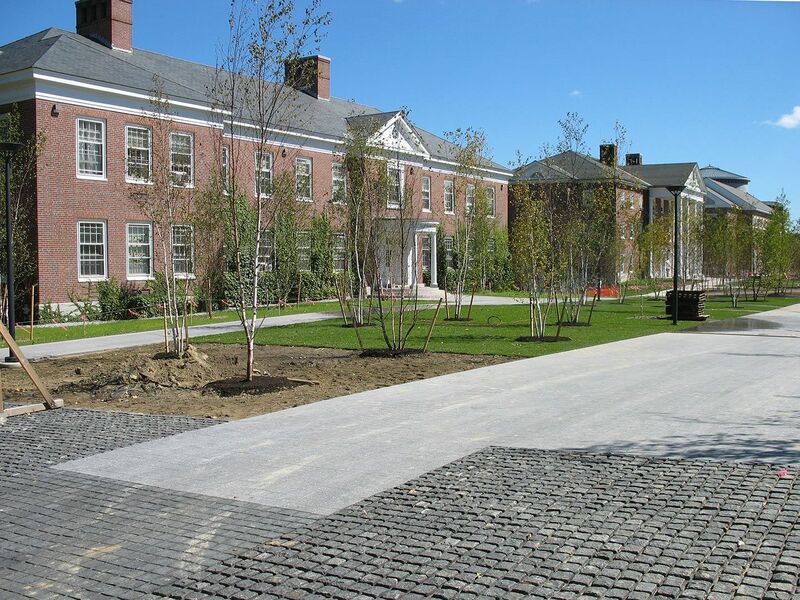 As this was written, the walk was usable nearly to Pettengill’s main entrance, and the paved plaza around the entrance itself was all but finished. Near the new Commons and Alumni Gym, workers started building concrete and brick piers for the Class of 1910 Gate, removed last fall when construction started. The signature pieces of the Gate have been stored since then, Farnsworth said. The Evelyn Minard Phillips Remembrance Garden in the same location will also be replaced. 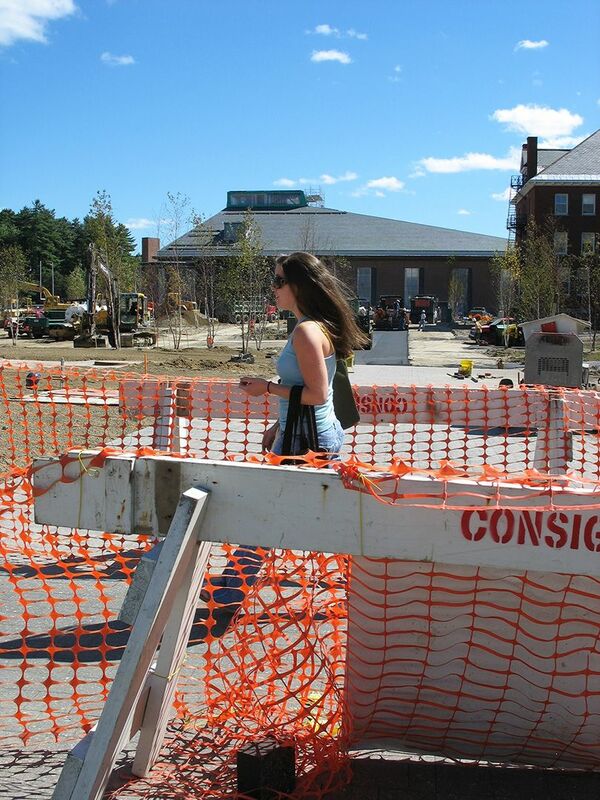 New dining Commons: “We’re on track,” said Farnsworth. The installation of window glass has begun, starting on the east and south sides. The application of gray zinc trim is proceeding around the building. Masons continue to place black granite at the west entrance, but otherwise the brick and stone veneer on the exterior is done, and the masons are heading inside to place granite trim there. They join the dozens of drywallers, painters, ceiling hangers, carpenters, electricians, etc., that for months have kept this beehive buzzing. Farnsworth reported that the tiling of the kitchen floor is essentially finished and tilers are now doing the walls. “Equipment for the kitchen should start showing up here shortly,” he said. The servery floor is next in line for tiling, starting the week of Sept 17. At the same time, craftsmen from Selmore Manufacturing, located a short walk from campus down near the river, made templates last week for counters in the servery and are fabricating them now. 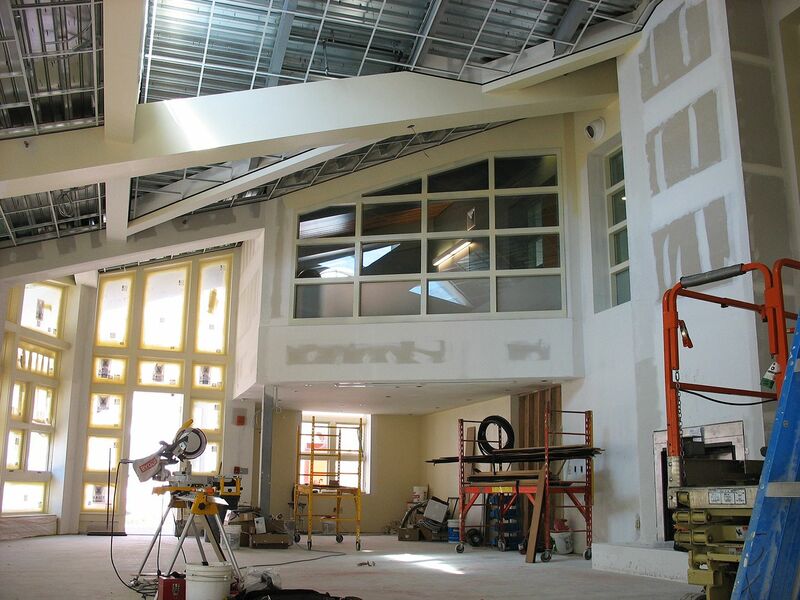 In the dining areas, the overhead drywalling is about finished and the installation of acoustic insulation begins soon. Meanwhile, carpenters are putting the decorative wood finish into the mezzanine overlooking the main dining area. 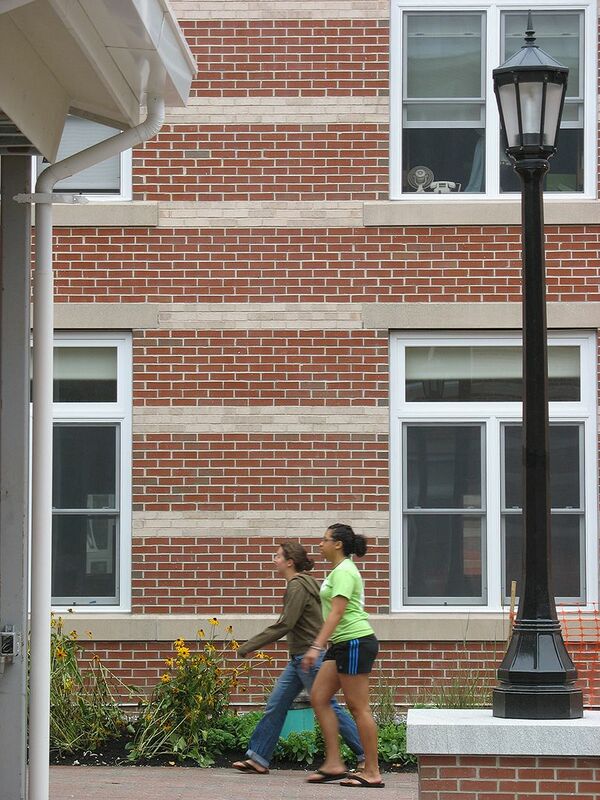 New student housing: Students, not construction workers, are causing most of the buzz these days at 280 College St. The building is fully occupied and nearly all the common spaces are in service. In fact, although its air-handling system still needed a tweak, the subterranean all-campus lounge was the site of an inaugural dance Sept. 7. But 20 or so workers are still coming and going. The action is centered on the space known until recently as the fireplace lounge — now the Frank J. Stangle Lounge, or Frank’s, thanks to a gift from Bruce Stangle ’70 and Emily Siegel Stangle ’72 in memory of Bruce’s father. Workers began to build the ceiling the week of Sept. 10, and there’s still painting, a little drywalling and other surface work to do before the lounge can open, likely in October. The ceiling will be finished in sustainably produced, cherry-stained wood, noted project manager Pam Wichroski. Another particularly snazzy effect will be slate trim in colors of blue, green and rust. Those colors will also appear in the furniture, a combination of soft seating, dining furniture, and tables of varying heights, including low ones at which floor-sitters can study. 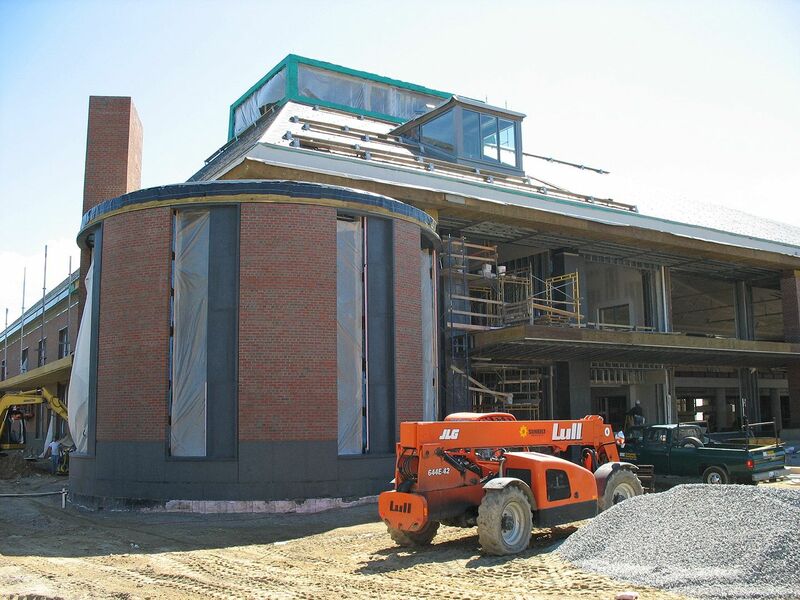 On the building exterior, brick work around the student living rooms is complete and metal trim is being fastened around the rooms’ glass walls. Paving and other hardscaping is nearly done, and landscapers were expected to finish plantings by mid-September. With a sigh, Wichroski added that in the race to rule the lawns at 280 College, the weeds have gotten the jump on the grass. “We’re trying to deal with that right now,” she said. Time for another weeds column? we suggested. “I was hoping not,” Wichroski laughed.